Man’s best friend can have his own sofa too! 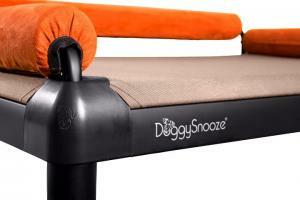 When we designed the DoggySnooze dog bed, we didn’t do it with the intent to create a designer dog bed. We did it with the purpose to create the most functional and durable dog bed possible that will blend into contemporary design. We like to think that the beauty of design is in the eye of the beholder, so it would be unnatural to focus solely on a product’s design. We have receive many comments from satisfied dog owners around the world describing how much they enjoy our dog bed and its design and, truth is, it’s quite flattering. The main functions we needed to implement in our dogs beds were usability of truly orthopedic features on an elevated and chew resistant dog bed while keeping design and form in mind so that the dog bed would blend with your furniture or fit in with your young and modernly designed living room. Finally fashion has met function. So, if your dog likes to sleep on your new, light-colored sofa – give them their own sofa. A DoggySnooze dog bed sofa (snoozeSofa). A durable, chew-proof dog bed, really? Yes, really! Durability is number three on the list of the five key elements of the DoggySnooze dog bed.It comes with a special quality – a limited lifetime warranty. In other words, we assure the dog bed’s durability. Now, let’s take a look at the design. The frame is made of aluminum and the corners are made of acrylonitrile butadiene styrene or ABS – a thermoplastic material know for its durability. Obviously, we cannot put a lifetime warranty on the bed layer and let’s face it, would you still want to that same sand or red colored bed after 20 years of use? The fact that you can replace the bed layer over time to match your furniture or décor is a very valuable feature. We use high quality Cordura nylon fabric that will last a long time, but the lifetimes of dog beds are mostly challenged by its inhabitants.Some dogs have a habit of chewing on their bed. Being bored and lonely are common causing for chewing on items around the house, including their own bed. Besides the expenditure of renewing a cushion type dog bed often, cushion type dog beds are filled with foam that contain toxic materials. You don’t want your dog chewing on foam material – even foam that is classified as non-toxic. A dog bed can be chew proof or better still, chew resistant, where the dog has no place to start chewing on it. Some cushions are chew proof when they have no zippers, but that should not be considered chew proof. Any cushion can be chewed – actually, dogs love to drag it around and jiggle it vibrantly. The DoggySnooze dog bed differs from other nylon fabric dog bed layers because with the DoggySnooze, your dog has no place to start the chewing. We enclosed the connection points inside the bed frame. They can dig on the fabric, but digging to a point where it rips through Cordura takes quite an effort. If you have a dog that tends to chew do not install the bolsters, because that part is not chew-resistant. The conclusion here is that a durable bed is one that has a metal frame with a bed layer where the connection points are enclosed. The frame will last forever and the bed layers only need to be renewed after years of use. The DoggySnooze dog bed is more expensive, but well worth the investment. Your dog will thank you for it. What are the benefits of an elevated or raised dog bed, you ask? There are many benefits, which we shall explain here. Have you ever realized that your own bed is also raised? First and foremost, the reason that beds are raised is that anything that comes from the floor, like cold, wet or fleas, will not come in contact with the bed. For dog owners in particular this is a concern because dogs can contract Flea Allergy Dermatitis (FAD), a common ailment caused by fleas. Fleas can to jump 6-7 inches up the air and almost one foot horizontally. The DoggySnooze is about 6 inches high and with the bolsters installed around the perimeter, the total height goes up to 9-10 inches of protection. Some pet stores recommend spraying conventional beds with a chemical, but why expose your pet to this why an elevated dog bed is a simple solution? Besides keeping your dogs free of fleas and insects, a raised dog bed like the DoggySnooze also ensures that your dog is always raised above the cold, hard floor. Unlike foam beds placed on the ground, an elevated dog bed prevents condensation, a factor which causes foam to rot. Furthermore, clean up is easy as the DoggySnooze comes with a machine-washable cover which can be simply removed by releasing the holding rods. Maintaining the cleanliness of the DoggySnooze bed frame is even easier; just wipe the bed with a wet cloth. Being a raised bed, it also allows you to clean the floor without moving the bed at all. Now that is comfort at its finest! There is also an aesthetic benefit with some of the elevated dog beds, especially the DoggySnooze. The legs and the side bolsters make it look more like a sofa to blend with other furniture. Function has met fashion. 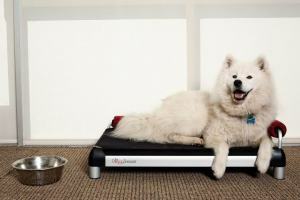 With so many benefits the question now becomes why not use an elevated dog bed, like the DoggySnooze? Hello friends! We’ve just uploaded our new demo video for the Buddy hands-free leash connector, demonstrating how it can be used during walking, jogging, hiking and biking. You can also learn about it on the Buddy website. 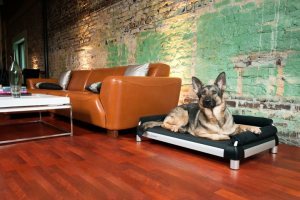 Dutch Dog Design’s DoggySnooze provides customizable, build-your-own dog beds for those with discerning tastes. Recently, GeekWire, a Seattle-based technology news site, released an article entitled “Meet the geek dogs of Seattle” introducing various local geek dogs. With geeks aplenty come dogs aplenty. Now geeky dog lovers (and their furry pals) can revel in the new adventure of choosing, building and enjoying a customized luxury dog bed that DoggySnooze provides. Dutch Dog Design is happy to report that GearPatrol showcased DoggySnooze during a product release, detailing the dog bed’s benefits, such as the high quality fabrics allowing for greater air circulation which reduces condensation and elevated height aiding to keep away fleas and other floor dwelling insects. For far too long, dog beds have been bland, boring run of the mill products. 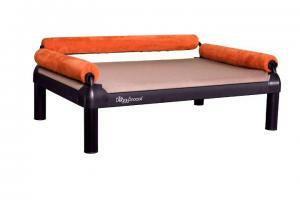 Over recent years, DoggySnooze has identified a need for and interest in convertible, customizable luxury dog beds. Built in a contemporary style, with luxury and comfort for a dog in mind, geeky (and non-geeky) dog owners can build a high-quality dog bed to their (and their dog’s) liking. Much like being able to visit a car buying website and click through and choose different options for interior and exterior colors and finishing materials and accessories, DoggySnooze uses the same customizing concept. Dog owners are able to visit the DoggySnooze website and choose the size of dog bed to fit the dog, choose from many different colors such as black, prairie sand, orange, green and chocolate to name a few, choose to add short legs, long legs, or even wheels for varied height and mobility, choose additional back and side bolsters which can transform a snoozePad to a snoozeLounge, snoozeSleeper or a snoozeSofa, and finally, there is the option to also add orthopedic memory foam for the dog to lay on. The memory foam provides a luxurious, breathable sleeping surface which will undoubtedly bring greater comfort to one’s dog. Choosing a DoggySnooze dog bed allows for the dog to enjoy a greater, more customized rest and relaxation experience while the owner gets to display a sense of sleek, contemporary customized design. So, geeky dog owners, take note, DoggySnooze allows the opportunity for your eye for luxury dog bed design to shine through while your dog reaps the rewards. Dutch Dog Design is proud to introduce its new Dutch Dog Amsterdam line of green, eco-friendly Dutch artist inspired dog collars and leashes. The products are made of polyethylene terephthalate (PET) recycled webbing and printed with eco-friendly, lead-free, non-toxic printing. If your dog chews on his leash, no harm is done. Dutch Dog Amsterdam stays true to its roots by taking inspiration from many notable Dutch artists. Arguably one of the Netherlands’ most famous post-Impressionist painters, Vincent van Gogh, whose work is known for its bold colors and raw beauty, serves as a key inspiration in the Dutch Dog Amsterdam product line. The line interprets one of his greatest and most well-known works, The Starry Night, on its collars and leashes. The bright and lively color palette allows your dog to trot around town in style. Piet Mondrian, painter and important contributor to the De Stijl movement, which is known for its use of clean, simple, modern lines and sole use of primary colors in addition to black and white, serves as another inspiration for our Dutch Dog Amsterdam line of leashes and collars. His work in neo-plasticism inspires the leashes’ and collars’ modern design which come life via the use of clean lines and bold primary colors. Something that a modern art loving dog owner may find appealing. Finally, Jacoba van Heemskerck, a woman of Dutch nobility, was a talented painter and glass artist. She experimented with modern art and cubism, but was always looking for new methods of self-expression. In 1916, she expanded her repertoire to begin working with stained glass. Dutch Dog Amsterdam exemplifies her work in its collars and leashes via the use of modern shapes and vivid colors, mirroring that which can be found in many of her paintings and stained glass pieces. Dutch Dog Amsterdam products are carefully thought out and crafted with your dog’s best interest in mind. Made of green, PET recycled webbing, the leashes and collars are soft against a dog’s body, yet strong. Printed with eco-friendly printing means that no toxic chemicals are used. Your dog is able to be happy and healthy using these products while you show a bit of Dutch art and style. You and your dog will be the hippest pair on the block. These dog leashes and dog collars are currently available for purchase in our Etsy store and Amazon store. When using the Buddy during a walk, jog or hike, attach the Buddy by simply looping it through a belt loop, or by looping it onto a backpack. It can also be attached to a bicycle’s frame by looping it around a seat post, seat stay or head tube, making it easy for a dog to enjoy going for a jog while its owner enjoys a short, leisurely bike ride. Parents with young children can also enjoy strolling with their children and dog as the Buddy can also be attached to a stroller, as well as many other things, making the Buddy a very versatile product. Made of shock absorbent bungee material, the Buddy allows for both a bike rider, hiker, walker or jogger and the dog to comfortably enjoy exploring the outdoors together as the bungee material absorbs shock and extra pull if a dog gets too distracted by an energetic squirrel. While other leash connectors, on bikes specifically, can be rigid and intimidate a dog, the Buddy is small, non-obstructive, easy to use and won’t harm or scare a dog. The simplicity of the Buddy’s loop design allows for quick and easy use, anywhere, anytime. Due to its simple design, the Buddy is also a very low-cost product, making this a product that any dog owner can afford. We encourage dog owners to get out and enjoy all that the outdoors has to offer in hiking, biking and jogging and walking, with their buddy and the Buddy.